tsulin + +: Thank you Netmums.com! 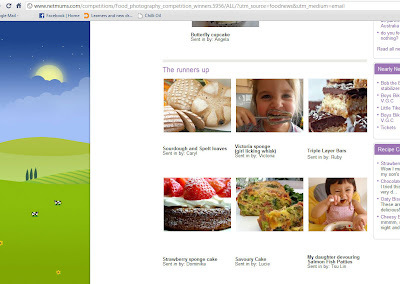 Last month, I submitted a photo for netmum's foodie competition ending 31 Mar. I received an e-mail on Fri that I was one of the runners-up. The prize being a "Feeding Kids" netmum's recipe book but the organisers have kindly given us a £15 Amazon gift voucher (to get the book) instead. The book has sold out on Amazon for now so Celine (from netmums) told me I could wait until they re-stock it or get something else. Congratulations! It's a very cute photo indeed. Congrats!!! I know how much you love your daughter!!! and that's why you can take such a wonderful piece :D Thanks for sharing!!! Wow! Congratulations! You are always winning stuff on the net. What luck!